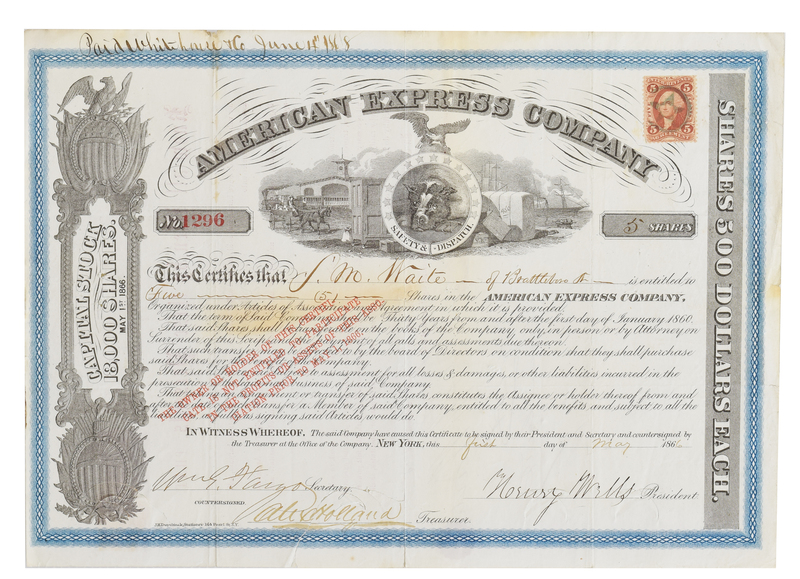 Incredibly clean 1866 American Express Stock Certificate Signed by Wells and Fargo. 11.625" x 8.25". Made out to a S.W. Waite for 5 shares It is boldly signed by both founders of the company and countersigned by Treasurer Alex Holland. The graphics are quite outstanding, with a train, roundhouse, ships, delivery wagon, safe, cotton and crated goods, and a guard dog labeled "Safety & Dispatch." The signatures are dark and clear. Minor age toning, A nice example of a desirable signed stock certificate in pristine condition.